What a full day. I actually had a lie in until 7:00 today, as it was a holiday, so was late having my breakfast and subsequently was joined by three of the other guests for a very civilised meal. I mentioned I had returned to a full house of muzungus and although three of them had left mid-week we still had two Danes and an American staying. 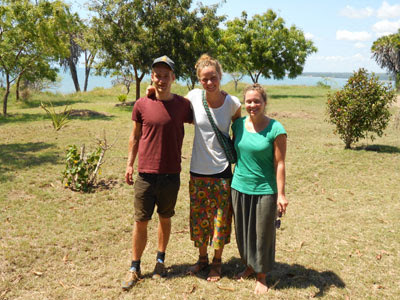 The three of them are working at various projects up in the hills beyond Tanga and were spending a few days recuperating at the coast. 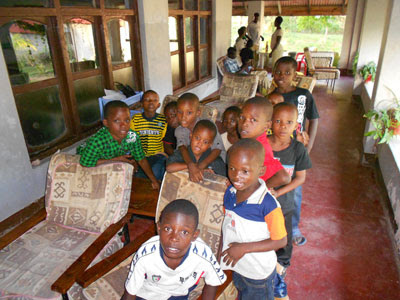 It was very pleasant to compare notes about our varying experiences of Tanzania and I was sorry to see them go when their car arrived for them mid-morning. I’m in the wrong job here; nobody sends a car for me! I spent a trouble free morning on the Internet (there’s a first) and managed to at least throw some thoughts at the screen for the blog. It’s certainly not ideal though, having to sit in my room with the projector churning out heat next to me when it’s in the high 30s outside. I’ve just read that again and I don’t suppose anybody is really sympathetic, are you. This afternoon Deo and I carried on with his swimming instruction and returned afterwards up the path to find the centre had been totally over-run by watoto (children). 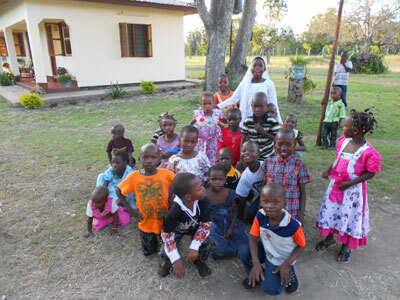 Eid ul-Adha, although a Muslim festival is obviously supported by all and the local children from Choba, the village that spreads along the Tanga road from Mkoma Bay, had put on their best clothes and come out to play. There must have been over a hundred at one time as well as adults and some teachers from the local school. What was reassuring as well was when a car pulled up and what looked like a family of three generations of Muslims got out. Eva set up a table and chairs on the newly mown grass for them and they settled down with their drinks. A community where the Muslims celebrate one of their festivals at a Christian centre must have a lot going for it. As dark descended the children left and gradually the other visitors drifted away and after a pleasant meal of kuku and rice I settled down for my usual evening drink with the locals. I’ve already said that I am quite intrigued by the Tanzanian version of draughts and the extra dimension introduced by a roaming queen. Tonight though I saw the game as it should be played. 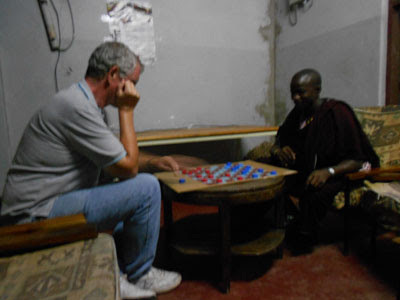 One of the Masai guards from the tented lodge next door came round and joined us for a game. After he had slaughtered Denis I stepped in to show off my new found skills and got truly hammered. He constantly seemed to work out traps many moves ahead and what looked at first sight like a killing move by me only opened the way a move later for the sucker punch to be delivered by him. He spoke no English but in my own way I assured him that in the six weeks I have remaining before flying out, I will win at least one game against him. This is not the first time by any means I have been shown up by a Masai warrior. We have a video at home where all 6ft 2ins of me looks like a latter day Don Estelle surrounded by Masai performing their famous leaps. Only disappointment of the whole day was when I checked with Denis and he informed me that the next holiday was Christmas so that's it for me this year. Hello Babu! This is the Yank you met a month ago :) I finally checked out your blog, after meaning to for a long time. I will be posting about it on my blog, I hope you don't mind? Mine is called Daughter of Norway. Karibu! On the seventh day ……..